The Thin Man was Dashiell Hammett’s last—and most successful—novel. Following the enormous success of The Thin Man movie in 1934, Mr. Hammett was commissioned to write stories for additional films. He wrote two full-length novellas for the films that became After the Thin Man and Another Thin Man. The Return of the Thin Man comprises both novellas. After the Thin Man brings back Dashiell Hammett’s classic characters: retired private investigator Nick Charles and his wife Nora. After vacationing in New York, Nick and Nora return to their home in San Francisco but soon find themselves investigating a love triangle gone murderously wrong. Nora’s cousin, Selma, is married to Robert Landis. Robert has been missing for three days. Reluctantly, Nick agrees to look for him, and it’s not too long before the retired detective finds Robert at a Chinese nightclub. Robert has been having an affair with Polly, a singer and entertainer at the club. Polly and Robert—along with nightclub owner—Dancer, are involved in an extortion plot to con money from David Graham, a man madly in love with Selma. The deadly trio intends to get rid of David once the money has been secured. But the case takes a strange twist when Robert is shot dead, and Selma becomes chief suspect. Can Nick prove Selma’s innocence? Or is she actually the murderer? In Another Thin Man, the death of a wealthy businessman on Long Island implicates everyone including Nick and Nora. Our intrepid investigators are invited to spend a weekend at Colonel Burr MacFay’s house on Long Island. MacFay manages all of wealthy Nora’s many assets. As they near the colonel’s mansion in a car, Nick believes he sees a body at the side of the road; but as soon as he manages to have the car hauled, the body has mysteriously disappeared. MacFay is living in fear, believing that one of his former employees, Phil Church, has come back for revenge, murder on his mind. It’s not too long before Nick is brought in to use his unique skills, and he quickly discovers that Church is actually living nearby. Nick decides to pay him a visit. When he meets up with him, Church is about to leave on a trip but claims he had been expecting Nick. He wants to tell his side of the story. The Return of the Thin Man is written in screenplay format, which might be off-putting to some readers. But aficionados of classic crime noir—or hardboiled fiction—will be delighted with these newly discovered gems, published for the first time, to add to their collection. Along with the two novellas, there are antidotes aplenty about Mr. Hammett’s legendary fight with alcohol, the studios, and various directors, which reads like a miniature biography. Unquestionably, Mr. Hammett was the walking blueprint for the crime genre with his extraordinary gift of gritty prose, but he also had a mighty talent for wry humor and classic one-liners, evidenced throughout the pages. Renowned Hammett scholar Richard Layman and Hammett’s granddaughter, Julie M. Rivett, are to be thanked not only for editing this wonderful book so expertly and lovingly, but for finally bringing it to the eyes of a new generation of readers. 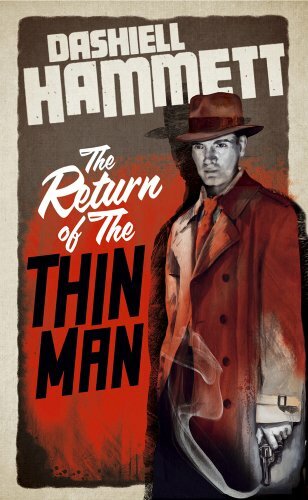 Read The Return of the Thin Man and rediscover why Dashiell Hammett was the peerless master of crime fiction in all its dark and bloody glory.